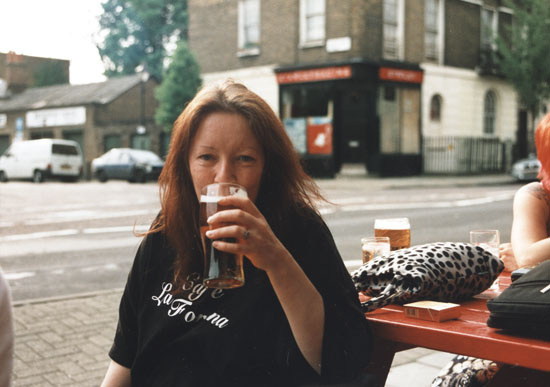 Carol Clerk is a vivid and indelible presence in my memories of my time at Melody Maker. The same surely goes for anybody who passed through the portals of that paper (and the public houses adjacent to it). I remember the impish twinkle in her eye, the cadence of her voice, the tininess of her frame (often brought into relief by the size of the pint glass in her hand). She was one of the most approachable people in the Melody Maker office but also probably the most formidable. I think I escaped getting a tongue-lashing from her at any point during my time at the Maker (even after "helping" out on the news desk one week with typing in information about new releases and inserting some made-up stuff about a couple of bands I detested). No doubt I would remember such a well-deserved telling-off if it had happened. Actually I'm surprised I was let off, because in my mind's eye I picture Carol as this newspaperwoman of the old school, a real professional, still chasing stories hard on a Friday afternoon, when most everybody else in the office was slacking off down the pub. The British music press was unique in that you could prosper there and get right to the top, without any journalistic training or being the slightest bit versed in traditional reporting or editing skills. Carol was an anomaly in that respect, in that she actually did have that training. If I remember correctly, she had worked at a newspaper or two on her way to ending up at the Maker. One thing that really amazed me was when I learned that she did her interviews without a tape recorder, just using a notepad, scribbling down the conversation in short hand. Carol was an anomaly in another sense, a woman in what was (especially when she started out) a male-dominated field. ("Dominated" always strikes me as a bit of an overstatement: I think most people in the music press really wanted more women to be involved… but at the same time it's true there could be a laddish aura about the Maker). Carol thrived despite this in part because she could out-drink, out-smoke and out-joke any of the men, but at the same time she managed to retain through it all an aspect that was…. motherly. Another admirable thing about Carol was the way she stuck with the music she was into, which was basically hard rock. There was no keeping up with what was au courant (she must have found so much of what got covered in the Maker--and the way it was covered-- to be ridiculous). Carol liked what she liked and with characteristic tenacity and loyalty she stayed with it.